Niche Cremation Urns are for use in a columbarium. A columbarium is a place for the respectful and usually public storage of cremation urns. Below is a small selection of niche cremation urns. Any urn can technically be used as a niche urn as long as it fits into the space designated at the columbarium. Please check with your columbarium for any regulations they may have on what can be used in their facility. 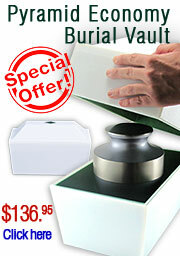 It is also important to verify the dimensions of your niche space to ensure that the urn you select will fit.